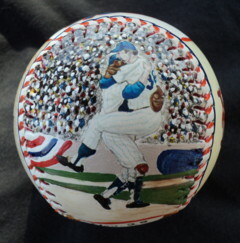 This Legends Hand Painted 1969 World Series Baseball features three of my original paintings. 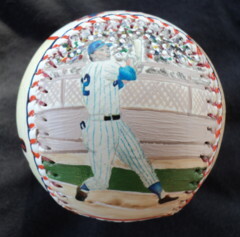 This Baseball Is Has Been Sold. Side one is my close up painting of the celebration. Jerry Grote and Jerry Koosman. Click here for a closer look. 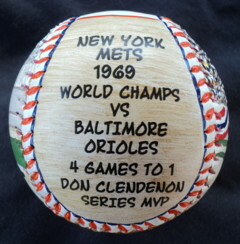 Side two has my painting of series MVP, Don Clendenon. Click here for a closer look. 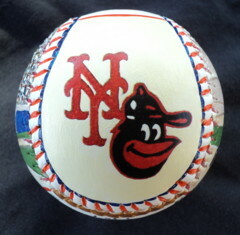 Side three has my hand painted New York Mets and Baltimore Orioles logos. Side four shows a few 1969 World Series stats. 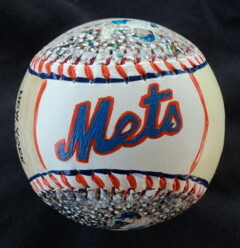 Side five, which is the top of the baseball, has has my hand painted "Mets" in team colors. 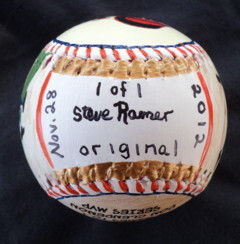 Contact Me To Purchase This Baseball.